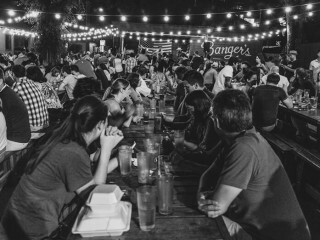 Enjoy a day of food, drink and music as Chef Ted Prater of Banger's Sausage House & Beer Garden smokes an entire hog from Yonderway Farm served with crawfish, sausage jambalaya and grilled chayote squash. The $15 Smoke Out plate comes with a side of specially tapped beers and live music by Urban Achievers, Dead Capital Music Band and more. Music starts at noon and the Smoke Out plates will start being served at 8 pm.